Tipping is often considered a personal choice that is done in private to reward good service. However, if you are picking up the tab for a business meal with a customer or client, tipping should not be considered optional—even if the service was not good. Bar Tenders: $1.00 per drink or 15-20% of your pre-tax bill. Buffet Wait Staff: It is not always necessary or appropriate to tip wait staff serving from a buffet, however, if you do, the standard tip is 10%. Host: It is not required that you tip hosts or others that greet and seat you. If you regularly visit a restaurant (especially those that are higher priced or harder to get seating), you can tip your host $10 to $20 on occasion. Pizza and Other Food Delivery Drivers: If you are having pizza (or other food) delivered to your home or office, the tip rules vary considerably. 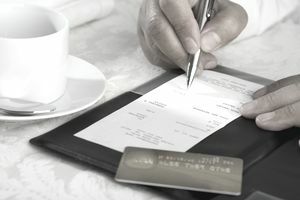 As in the case of a sit-down restaurant, tipping is optional, but some restaurants add a delivery fee to your bill (usually about $3.00) (delivery fees may be slightly higher when food is delivered to an office). For delivery orders of $20.00 or less, it is customary to offer a minimum tip of $3.00. For any amount over $20.00 tip 10-15% but never less than $5.00. Restroom Attendants: Depending on the services offered the customary tip is $0.50-$3.00. Since your client or co-workers are unlikely to follow you into the restroom, let your conscience guide how much you should tip. Like wait-staff in restaurants, restroom attendants may rely on your tips for income. It would be considered rude not to at least offer the minimum suggested tip of $0.50. Sit-Down Wait Service: 15-20% for good service. Wait staff are often paid less than the standard minimum wage and rely on tips for income. Tipping waiters and waitresses is optional, but not tipping is usually perceived as being “cheap.” If you are with a client or other business professional where one's image is important, no matter how bad the service, leaving a small tip is better than not tipping at all. Take-Out and Curb-Side Staff: Many restaurants offer phone-in ordering and curbside (or inside) pick-up. Tipping is not required. But if you want to tip for receiving special or extraordinary service, the general guideline is up to 10% of the pre-tax bill. Tip Jars: You should not feel obligated to chunk your change into a tip jar and certainly not more than a dollar. Tip jars are nothing more than counter-top pandering. The haul is usually divided among co-workers who do not rely on tips (like wait staff do) for income and even shared with employees who did not provide you with any direct counter service. If you want to tip one employee, in particular, give the tip to them directly – not the tip jar. Valet Parking Services: The standard tip for valet parking is $2.00-$5.00 when your car is brought to you. Final Tips on Tipping: Never try to impress your business associates and clients by making a show of tipping. Do not draw attention to your tip but do be aware that the person you are with may be watching to see if you tip and how much!